Having decided on an appropriate name for your cleaning business, you’ll want to think of a corresponding logo to match it. Logo design is a science; sure you can design a simple logo yourself, or have someone do it for you for as low as $10, but would that be enough given the importance of the matter? Logos are as important because they are the visual through which your prospects connect with your cleaning business. It’s what identifies your business as a unique entity. It associates your brand with professionalism and builds trust. A well thought, well designed logo for your cleaning company will prove to be a valuable asset when it comes down to promoting your services to potential clients. You want to imprint your brand on their memory to make the most of your advertising spending and your overall promotional efforts. And to do that you need a powerful logo. This article is meant as an introduction to logo design philosophy in general and how it specifically applies to cleaning businesses. The goal here is to give you all the information you need when discussing your logo with a designer or when designing a logo yourself. That way you’ll both know what to ask for and what to expect of your designer. Your Logo must relate to your cleaning business. This is very important and it’s exactly why a good logo can cost you several hundred dollars. Your logo must say something about your cleaning company. The obvious part is that your cleaning business name should be on the logo except if you’re going for a text-free one. What’s more important though is to somehow have your logo correspond to your cleaning company’s ethics, philosophy and business practices (i.e. Eco-friendly Cleaning Services). Eye-Catching and simple. It goes without saying that your cleaning business logo must be eye catching. Some designers misinterpret this point and come up with extremely flashy and complicated designs. That’s old news. In today’s world, simplicity and minimalism is the best way to go. Simple designs are by far more eye caching and people relate more to them as they better match they short attention span. Professional. Keep in mind that your clients don’t know you personally and they won’t hire you because you’re a good guy or girl. They need to know you’ll handle the job they have to offer professionally. 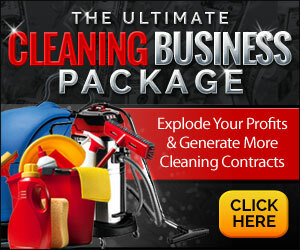 Your logo is probably the first element of your cleaning company that your potential customers will get in touch with. First impressions are vital. Very hard to change down the road. Which is exactly why you do not want to risk with a bad logo design and to take this further, a bad flyer or advertisement (of any form). Coloring. People associate colors with emotions. Picking the right colors maybe a detail but why settle for less if you can have more? Here’s an interesting site explaining what certain colors mean to people so you have a better understanding of the topic. You can consider any colors but one could argue that BLUE and GREEN or a combination of the two have a clear advantage. Blue is for inspiring confidence, trust and professionalism and green is to associate your company with freshness and harmony which easily relate to cleaning services. You can have a logo that’s text dominated or a logo that has no text at all. That widely depends on your personal preferences; it doesn’t directly affect the quality of your logo. Keep in mind though that less is more with logo design. Your logo isn’t a newspaper ad. You can go as far as including your cleaning business name and up to a slogan but that should do it. You have a number of options. We’ll demonstrate some of them below. Note that the following are not actual logos rather than simple designs demonstrating the variety of options available to logo design. Text-driven design samples. Simple and elegant. No graphics whatsoever. Text-driven design with a small slogan. 1-2. Text-driven logo with a small icon implemented. 3. Logo containing both text and graphic as well as a company slogan. 4. Graphic based, text-free logo. When considering your ideal logo design, think of what makes you special. Of what your strong points are, what you want your logo to communicate to your customers overall. Be it a modern, a classic or a retro design. Be it specific about the cleaning services you offer (house cleaning for example) or more general if you do both house and commercial cleaning. If you’re solely offering specialized cleaning services such as carpet or window cleaning, it’s a good idea to implement that in your logo so people can quickly associate your company with the respective market. Where To Get A Logo For Your Cleaning Business? If you don’t have graphic design skills yourself, you should consider hiring a logo designer to create a logo for you. Make sure you provide your designer with as much information as possible and don’t hesitate to ask for revisions if the designs don’t rise do your expectations. You can hire an independent contractor or a logo design firm for the job. Another option is to host a logo design contest using sites like Freelancer.com or Odesk.com. That way you can access tens or even hundreds of approaches by different designers and proceed with the one(s) you like. It’s a very cost-effective solution.